Adrenal Support, 60 Vegetarian Capsules each (Nature's Wonderland) - Penn Herb Co. Ltd. The adrenal glands affect metabolism and mood, and are involved in the production of important hormones including cortisol and adrenaline. Nature's Wonderland Adrenal Support promotes healthy adrenal function, energy & stress management. L-Tyrosine...the feel-good amino acid relieve stress and promotes positive mood. Rhodiola...anti-stress tonic promotes physical and emotional well-being. Pantothenic Acid (Vitamin B5)...supports the production of energy and is necessary for the proper functioning of the adrenal glands. 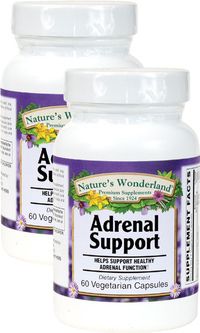 Smooth out the rough edges of your hectic days with Adrenal Support! As a dietary supplement, adults take 2 vegetarian capsules daily at mealtime, or as directed by a health care professional.